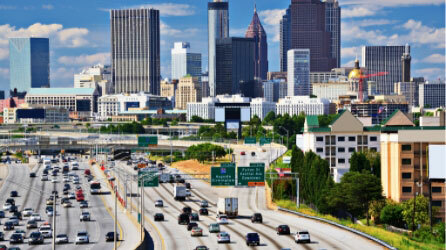 Atlanta leads the way in several facets of culture, and the performing arts are no exception! We’re fortunate to have many talented performers call Atlanta their home, providing us with an endless source of excitement. If you want to see what sets us apart from the rest, make plans to see a show at one of these Midtown Atlanta Theaters! There’s something for everyone, from breathtaking plays to thrilling concerts. Scroll down to get started, and don’t forget to explore our free Travel Guide for plenty of local tips and more attractions! Catch a Show at One of Our Favorite Midtown Atlanta Theaters! The goal of Synchronicity Theatre is to perform “smart, gutsy, and bold theatre.” When you attend a show, you can join the list of people confirming their success in doing so! Their talented staff isn’t afraid to highlight critical social issues for inspirational content. They have been in the industry for over 20 seasons, and each performance is more compelling than the last. Just five minutes from Stonehurst Place, you can take a seat in their 140-seat theater for an intimate theater experience. Don’t forget to check out their Women in the Arts Panel Luncheon, which we proudly sponsor! For shows that are sure to take your breath away, check the schedule for Alliance Theatre as well! Since 1968, this acting company has been captivating the hearts and minds of audience members. Many of their shows have even earned Tony Awards! You can enjoy their performances at multiple stages within the Woodruff Arts Center. You might also find them at unique venues like the Atlanta Botanical Gardens! Alliance’s shows often sell out, so get your tickets early! If you’re looking to catch a performance by one of your favorite bands, Center Stage Theater is a safe bet. Known for hosting some of Atlanta’s best concerts, this venue features top-of-the-line sound and lighting systems on three stages. You can enjoy performances across a variety of genres from hip-hop to rock, and you won’t leave disappointed. Plus, each stage includes a full-service bar! Whichever show you choose to attend, you’re in for a memorable experience. With a variety of performances, a fascinating history, and impressive amenities, it would almost be better to mention what Fox Theatre doesn’t have! The beauty of the facade is exceeded only by the incredible architecture and design inside. Buy your tickets, step through the doors, and get ready for a breathtaking show in an elegant atmosphere. You can even upgrade to the Marquee Club for luxurious seating with access to a rooftop terrace, premium bars, and exclusive service. Check their schedule to discover events from stand-up comedy to Broadway shows! While you’re in the city, why not make it dinner and a show? Try some of the area’s acclaimed cuisine by dining at some of our favorite restaurants in Midtown Atlanta! Enjoy Lodging as Impressive as the Performances! Even after the curtain falls at these theaters, your unforgettable experience in Atlanta doesn’t have to end! We invite you to visit Stonehurst Place to enjoy elegant lodging and top-notch amenities right here in Midtown Atlanta. Southern Living readers named us as one of the South’s best inns, and it’s easy to see why! 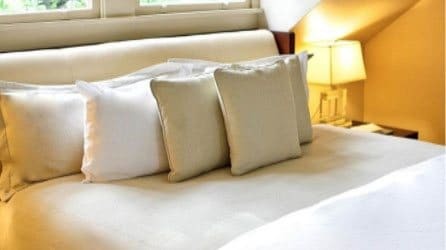 Consider our Master Suite for a luxurious, relaxing atmosphere after a show in the city. Whether you’re lounging in your king-size bed or unwinding by the warmth of the fireplace, you’re sure to feel right at home. Plus, you can look forward to gourmet breakfasts each morning in our beautiful dining area. When you book your stay, take advantage of our direct booking discount and get one step closer to a delightful experience in Atlanta! How to Spend a Day at the College Football Hall of Fame — What Makes the Museum of Design Atlanta So Fascinating?